Water, maltodextrin, soybean oil, vinegar, salt, sugar, parmesan cheese, modified corn starch, liquid whole egg, liquid yolk, torula yeast, dried garlic, spices, potassium sorbate, anchovy paste (anchovies, salt, soy flour, water), xanthan gum, phosphoric acid, fumaric acid, colour, natural flavour, propylene glycol alginate, calcium disodium edta. Contains: milk, egg, anchovy, mustard, soy. The Hellmann's name is recognized throughout the world for unrivaled quality and flavour. 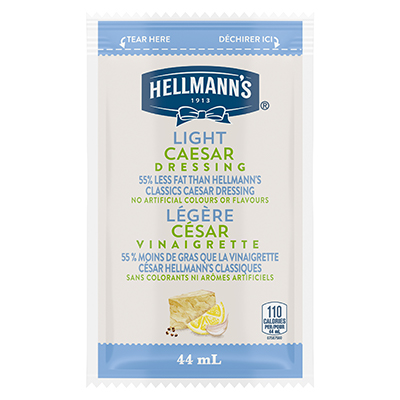 Hellmann's Light Caesar Salad Dressing offers premium quality with shelf-stable convenience. This gluten-free salad dressing is also versatile, with alternative applications ranging from marinades and dips, to glazes and finishing sauces. Serve with fresh vegetables or wings. Great for take out salads.